Mycoplasma fermentans has been associated with rheumatoid arthritis. Recently, it was detected in the joints and blood of patients with rheumatoid arthritis, but it is not clear yet how the bacteria enter the body and reach the joints. The purpose of this study was to determine the ability of M. fermentans to induce experimental arthritis in rabbits following inoculation of the bacteria in the trachea and knee joints. P-140 and PG-18 strains were each injected in the knee joints of 14 rabbits in order to evaluate and compare their arthritogenicity. P-140 was also injected in the trachea of 14 rabbits in order to test the ability of the bacteria to reach the joints and induce arthritis. M. fermentans produced an acute arthritis in rabbits. Joint swelling appeared first in rabbits injected with P-140, which caused a more severe arthritis than PG-18. Both strains were able to migrate to the uninoculated knee joints and they were detected viable in the joints all along the duration of the experiment. Changes in the synovial tissue were more severe by the end of the experiment and characterized by the infiltration of neutrophils and substitution of adipose tissue by connective tissue. Rabbits intracheally injected with P-140 showed induced arthritis and the bacteria could be isolated from lungs, blood, heart, kidney, spleen, brain and joints. M. fermentans induced arthritis regardless of the inoculation route. These findings may help explain why mycoplasmas are commonly isolated from the joints of rheumatic patients. Numerous studies have demonstrated that some viruses and bacteria including mycoplasmas could be related with the pathogenesis of arthritis [1–4]. The primary habitats of human and animal mycoplasmas are the mucous surface of the respiratory and urogenital tracts, the eyes, mammary glands and joints . Mycoplasmas have been incriminated as causative agents of arthritis since they were found in rats and mice with natural arthritis 50 years ago [6, 7]. Bartholomew isolated M. hominis, M. hyorhinis and M. arthritidis from the synovial fluid in 14 of 17 patients with rheumatoid arthritis, systemic lupus erythematosus and Reiter's Syndrome in 1965 . Williams et al. reported the presence of Mycoplasma fermentans in the synovial fluid of patients with rheumatoid arthritis , but these results could not be reproduced in further investigations probably because of the fastidious growth requirements of the microorganism . Recently, in 1997, Schaeverbeke et al. using molecular biology tools detected and also isolated M. fermentans in joints of patients with rheumatoid arthritis and other joint disorders [10, 11]. Further, Johnson et al. detected M. fermentans by PCR in 88% of synovial fluid samples from patients with different arthritis . Schaeverbeke et al. studied and compared the genotypic characteristics of seven strains isolated from the synovial fluid of patients with arthritis with three reference strains of the bacteria . Recent studies have also shown the presence of M. fermentans DNA and specific antibodies to the bacteria in the synovial fluid of patients with rheumatoid arthritis . This mycoplasma has been detected in blood of patients with rheumatoid arthritis, producing systemic mycoplasmal infections , these results suggest that M. fermentans may play a role in the development of the disease. Some mycoplasmas may act as unspecific mitogens of B and T cells, while other mycoplasma (M. arthritidis) produce MAM, which shows superantigenic activity [5, 15]. M. fermentans possesses a potent immunomodulator product named macrophage activating lipopeptide 2 (MALP-2) which activates macrophages to release cytokines which may in turn increase the neutrophilic infiltrate into the joint. MALP-2 could induce the release of macrophage-derived 5'-nucleotidase, this enzyme may occur in joints in excessive amounts when M. fermentans is present in patients with rheumatoid arthritis . These abilities are used by mycoplasmas during the induction of natural arthritis in animals. Mycoplasmas are common inhabitants of the human respiratory and genitourinary tracts where they produce chronic infections, they also are able to invade other tissues and in some cases induce an autoimmune response . Pathogenesis of some human mycoplasmal infections is poorly understood, that is the case of Mycoplasma fermentans. Even this microorganism has been isolated in the joints of rheumatic patients; it is not clear how the bacteria enter the body and how they reach the joints. On the basis of these observations we attempted to experimentally reproduce an arthritic disease in rabbits employing a M. fermentans strain isolated from the respiratory tract of humans. The second purpose of this study was to test if this strain when injected in the respiratory tract was able to reach the joints and induce arthritis. M. fermentans P-140 was isolated from the respiratory tract of asthmatic patient in our laboratory  and M. fermentans PG-18 was a kind gift of Dr. Gail H. Cassell (University of Alabama at Birmingham). The strains were grown at 37°C in l liter of E broth consisting of 2.1% (wt/vol.) PPLO broth base (Difco), 20% (vol./vol.) horse serum, 0.002% (wt/vol.) phenol red, 0.25% (wt/vol.) glucose and 10% (vol./vol.) yeast extract. Forty-nine New Zealand-White rabbits weighing 3 to 4 kg were used. The animal protocol complied with all relevant and institutional policies including the Helsinki Declaration. Blood and throat swabs of animals were checked for the genus mycoplasma by culture and PCR in order to determine that rabbits were mycoplasma free. The right knee joints of 14 rabbits were injected with 0.1 ml of a broth culture that contained 1 × 106 colony forming units per milliliter (CFU/ml) of Mycoplasma fermentans P-140. Also 14 rabbits were injected with 0.1 ml of broth cultures that contained 1 × 106 CFU/ml of Mycoplasma fermentans PG-18. The left joint received no treatment and was considered a control. As negative controls seven rabbits were injected with 0.1 ml of E broth (mycoplasma free) in the right knee joint. An increase in the joint diameter was considered an indicator of joint swelling. The diameters were measured twice every third day during the experiment. Two rabbits of each experimental group and one from the control group were sacrificed on day 3,5,8,13,20,27 and 34 after the injection. Both the left and right synovia received the same treatment; the synovial membrane was divided in two parts. The presence of viable mycoplasmas was determined by inoculating one half of the synovial membrane in l ml of E broth and ten fold serial dilutions were also cultured an inoculated onto agar . Blood cultures were performed. The presence of aerobic flora in synovium was determined by plating sheep blood agar plates. Knee synovia were removed and immediately fixed in 10% formalin pH 7.0. Samples were embedded in paraffin, sectioned and stained with hematoxilin and eosin. Fourteen New Zealand white rabbits were intracheally injected with 0.1 ml of a broth culture that contained 1 × 106 CFU/ml of Mycoplasma fermentans P-140. Valuation of joint swelling and sacrifice of the animals were performed in the same way as in the experiment about M. fermentans arthritogenic ability. Five milliliters of blood were extracted from heart and cultured before sacrifice. Animals were sacrificed by the injection of 5 ml of Anesthesal. Brain, trachea, lungs, heart, spleen, kidney and knee joints were extracted, 1 cm3 of tissue or half of the synovia were deposited in 0.9 ml of E broth and ten fold serial dilutions were also done . 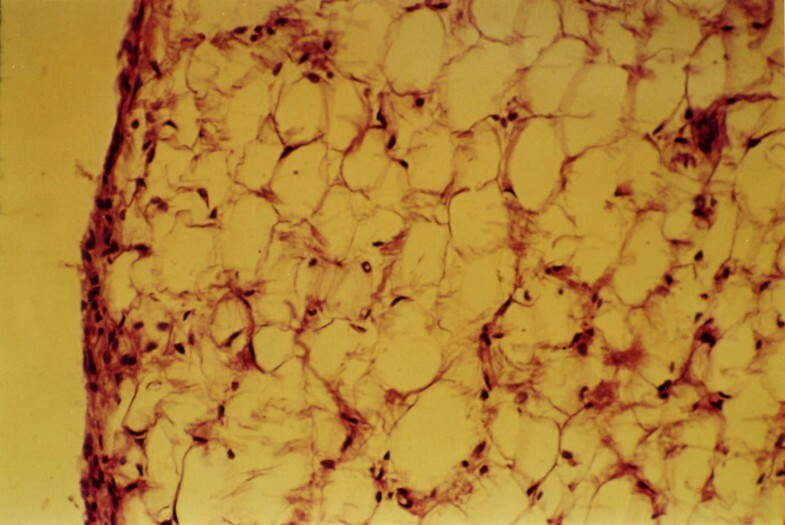 Tissue and synovial cultures, and histopathological study of the synovia were performed as described in the experiment of arthritogenic ability of M. fermentans. A Polymerase Chain Reaction (PCR) test was used to confirm the presence of M. fermentans in synovial tissues. The oligonucleotide primers used for PCR detection were RW004 5'(GGACTATTGTCTAAACAATTTCCC) 3' and RW005 5'(GGTTATTCGATTTCTAAATCGCCT) 3' designed by Wang, which amplified a 206-nucleotide specific gene sequence within the insertion sequence-like element that exist in multiple copies only in the M. fermentans genome . Before we used this PCR based test to detect M. fermentans, we confirmed the specificity of these primers. The reaction mixture contained 50 mM KCl, 1.5 mM MgCl2, 10 mM Tris-HCL (pH 8.3), 0.2 mM of each deoxynucleotide triphosphate, 6 μM of each primer and 1 unit of AmpliTaq® (Perkin Elmer Cetus, Emerville, CA.) in a total volume of 50 μl. The sample to be analyzed (5 μl) was always added last. A diluted lysate of M. fermentans PG-18 corresponding to 100 CCU and sterile water were used as positive and negative controls respectively. The amplification involved 40 cycles, each consisted of denaturation at 95°C for 25 s, primers annealing at 60°C for 60 s and extension at 72°C for 60 s. The amplified products were analyzed by electrophoresis in 2% agarose gels and visualized by UV light after ethidium bromide staining. Many researchers use at least three animals for each time point for a better statistical and experimental reproduction. Although, animal models offer several advantages, one disadvantage is the cost. We used 49 rabbits in our study and it represented a considerable cost so we were not able to use a greater amount of animals. In previous studies where we used the rabbit model to test the arthritogenic ability of M. pneumoniae, M. pulmonis and M. arthritidis we injected 6 animals with each strain and we had a small standard deviations and small animal-animal variations. These facts gave us the confidence to use only 2 rabbits in each time point. However, the use of only two animals may lower the statistical power of the results. The Mann Whitney U-statistic was used to assess the statistical difference between articular diameters of M. fermentans PG-18 and P-140 and to compare the recovery of mycoplasmas in the knee synovial samples. The Kruskall-Wallis test was used to compare M. fermentans PG-18, P-140 intraarticular injected, P-140 intracheally injected and control. When animal models are used it is important to check that they are mycoplasma free because the presence of these microorganisms would change the results. The rabbits that we used were free of any genus of mycoplasma in the sites tested. One goal of this study was to experimentally reproduce arthritis in rabbits employing a clinical isolate from the human respiratory tract and compare it with the arthritis produced by a type strain. We used a strain isolated from the respiratory tract instead of one from joints because we wanted to test that a mycoplasma isolated from the human respiratory tract was able to induce arthritis. We found that rabbits inoculated with Mycoplasma fermentans P-140 showed increases of five percent in the knee joint diameter during the first seven days postinoculation. Then a decreased was observed, during the days 11 and 15, joint diameters increased to 3.5% and other increase (4 %) in volume of the joint was observed on days 17 and 19. (Table 1). Increases of joint diameter in rabbits injected with M. fermentans P-140, PG-18 and controls. Joint increments induced by Mycoplasma fermentans PG-18 were lesser than those induced by M. fermentans P-140. The only significant increment of the joint diameter (3.8%) produced by M. fermentans PG-18 was observed on day 23. This increase was similar in magnitude to the second increase induced by M. fermentans P-140 (Table 1). After 27 days a slow decrease of the joint diameter was observed in both groups of rabbits. The group of rabbits that received E broth showed a minimum increment of the joint diameter (0.7%), starting in the day three and on day 15 the inflammation disappeared. Kruskall-Wallis test showed statistical differences (P < 0.0001) in the increases of the joint diameter induced by experimental group respect to control group. No statistical difference was observed in joint diameters between M. fermentans PG-18 and P-140. M. fermentans P-140 induced more severe inflammation in right knee joints than PG-18 (p < 0.005). Synovial samples obtained from knee joints injected with M. fermentans P-140 and PG18 showed 197 and 95 CFU/ml of the organisms respectively, after three days postinoculation (p < 0.05). At the end of the experiments the number of mycoplasmas isolated dropped to 37 and 29 respectively (p > 0.05). In the left knee joints (which were not inoculated) 38 CFU/ml of P-140 were recovered during the first three days and 25 CFU/ml of PG-18, by the end of the experiment 43 CFU/ml and 35 CFU/ml, respectively were recovered. A significant difference (P = 0.01) was observed in the recovery of M. fermentans PG-18, between right and left synovium (Table 2). Aerobic bacteria were not isolated from the culture in blood agar. Both strains were recovered from blood cultures, suggesting that mycoplasmas reach the blood stream and this could explain in part why the uninoculated knee joints contained mycoplasmas by the end of the experiment. PCR detection showed 206-bp products in the synovium samples. Control rabbits did not show amplified fragments. Recovery of Mycoplasma fermentans from the synovial membrane of rabbits. • Days after the intraarticular injection of mycoplasmas • Each value of CFU is the mean of two animals. Abbreviations: CFU = colony forming units. S.D. = standard deviation. Once we observed that M. fermentans P-140 was able to induce arthritis when it was intraarticular injected, our goal was to test if M. fermentans P-140 was able to induce arthritis when it was injected in the respiratory tract of rabbits. After M. fermentans injection in the trachea, the microorganism was detected by culture and PCR in blood, brain, lungs, heart, spleen, kidney and both knee joints suggesting that M. fermentans reached the joints by blood. Three days after tracheal inoculation M. fermentans induced a small increase in joint diameter, the greatest increase was observed on day 13, then joint diameters reached the original size (diameter before M. fermentans injection) (table 1). Unfortunately we did not quantify mycoplasmas in the knee joints but we detected the bacteria by culture and PCR in both joints. Histological examination of the control group revealed a layer of adipose tissue surrounded with a slim synovial membrane. (Figure 1). M. fermentans P-140 generates histological dramatic changes with respect to PG-18, 27 and 34 days postinjection. Mainly histological changes were characterized by the infiltration of neutrophils, synovial membrane proliferation and inflammation. The substitution of adipose tissue by connective tissue and the presence of plasmatic cells were more marked toward the day 30. M. fermentans P-140 showed greater amounts of neutrophils and a complete substitution of adipose tissue by connective tissue. (Figure 2). While, in M. fermentans PG-18 there was not a complete substitution of adipose tissue by connective tissue. 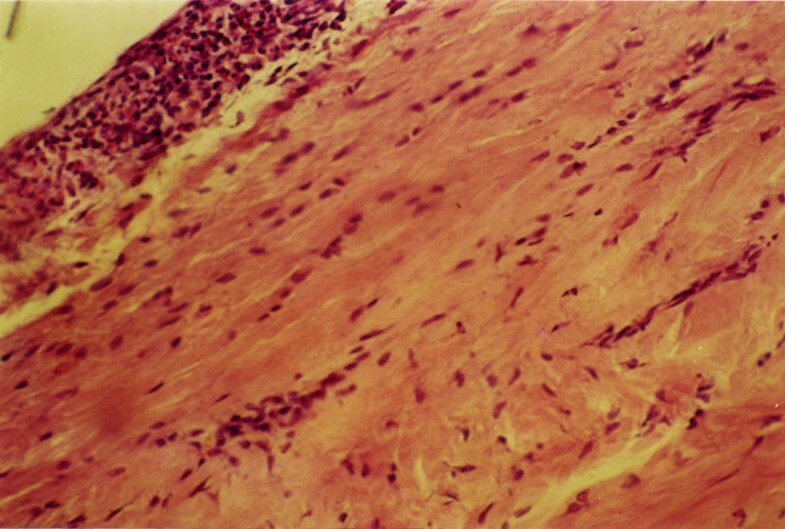 Histological examination (40X) of knee synovium from negative control group, showing 2–3 layers of synovial cells that surround adipose tissue. Histological findings (40X) of knee synovium from M. fermentans P-140 infected group, showing hyperplasia of synovial cells (more than 10 layers). A complete replacement of adipose cells by connective tissue in the presence of inflammatory cells is also observed. Mycoplasmas are common causes of natural arthritis in animals. Mycoplasmas may infect the respiratory and genitourinary tracts, mammary glands and joints of animals and humans . It has been difficult to determine the etiological agents of rheumatoid arthritis in humans due to its multifactorial nature, but animal models have proved to be helpful in these regards. Animal models have been useful to determine the role of mycoplasmas as arthritogenic agents but the outcome of these experimental models depends on several factors such as the inmmunological state of the host, the virulence of the microorganism inoculation site, size and concentration of the inoculum . Washburn et al. showed that rabbit is a good model to test the arthritogenic ability of M. pulmonis and M. arthritidis. In a previous study we used the rabbit model to show that M. pneumoniae was able to induce arthritis . This arthritogenic ability is important because M. pneumoniae may produce extra-respiratory complications in human beings . The pathogenic role of M. fermentans has not been completely defined. The aim of this study was to test and compare the arthritogenic ability of a clinical isolate of the respiratory tract with a type strain and to test if M. fermentans P-140 when injected in the trachea is able to reach the joints and induce arthritis. M. fermentans P-140 injected in the joints induced a more severe arthritis than the one induced by M. fermentans PG-18 strain during the first days postinoculation showing a greater ability to migrate to the uninoculated left knee joint than PG-18 strain. The histological study of synovial tissue revealed few changes in the knee joints injected with PG-18. However, when rabbits were injected with the P-140 strain a marked local inflammatory response with fibroblast and cellular infiltration, constituted by lymphocytes and plasma cells were shown. M. fermentans P-140 has been isolated from the human respiratory tract , it has had few passages in the laboratory while PG-18 is a type strain isolated from the genitourinary tract and has been passed in the laboratory several times, so the lower arthritogenic ability of M. fermentans PG-18 could be attributed to the fact that mycoplasmas show attenuation of virulence by continuous broth passage [21, 23, 24]. Mycoplasma fermentans persisted in the joints during all the experiment but fewer colony forming units were recovered from knee joints of rabbits by the end of the study. The fact that P-140 was recovered from synovia suggests that this anatomical site or environment is a suitable biological niche for the bacteria. Several other studies have shown that the destruction of epithelial cells during arthritis; promotes the growth of mycoplasmas by the release of substances, which can be used as nutrients by mycoplasmas, and it creates the basis for further damage to the joint . Washburn et al. and Kirchhoff et al. showed that microbial products or the mere cellular lesion could stimulate the secretion of cytokines, which play an important role in the development of arthritis [18, 25]. Since the joint seems to be a natural habitat for Mycoplasma fermentans it is reasonable to assume that the organisms are at least partially protected from the host defense mechanisms and are able to survive for several days after injection. We isolated viable M. fermentans P-140 and PG-18 five weeks after injection in both joints. The isolation of mycoplasmas from blood suggests that M. fermentans could have used this route to reach the left knee joint. The transient arthritis that we observed in the right knees also suggests mycoplasma persistence after injection. Once we tested the arthritogenic ability of M. fermentans it was important to determine if the microorganism was able to reach the joints and induce arthritis when it was injected in the trachea. The respiratory tract could be one of the natural entrances of M. fermentans to human body. Two days after the inoculation of M. fermentans to the trachea the bacteria have already reached the blood, joints, lungs, spleen, brain, kidney and heart of rabbits. In the joints it was able to induce an inflammatory response that began on day three after injection, the most severe inflammation was observed on day 13 then the inflammatory response decreased, on day 25 the rabbits have already reached their initial joint diameter. Some differences were observed between animals injected in the trachea and the ones injected in the knee joints. When animals were intraarticular injected, the microorganism induced a more severe inflammatory response than the one induced by M. fermentans injected in the trachea. Probably because the bacteria did not have to evade the defense mechanism of the host, the microorganisms are deposited directly in the joints where they reproduce, liberate toxic substances, produce tissue damage and induce arthritis. When M. fermentans is injected in the trachea, the bacteria have to evade the host defense responses of the respiratory tract, pass to the blood and later reach the joints where they reproduce and induce arthritis. When M. fermentans were injected in the trachea they induced a less severe arthritis that disappeared in few days, the histopathological damage was also resolved and the animals recovered the initial joint diameters. Although M. fermentans is a human pathogen suspected to be involved in the induction of arthritis since 1970 , its pathogenesis mechanisms are poorly understood. It is not known how M. fermentans reaches the joints and induces arthritis. The detection of M. fermentans in joints of rheumatic patients incriminates this microorganism as a cause of arthritis in humans [10, 11]. In a previous study, we isolated these bacteria from the respiratory tract in 6 % of a population of asthmatic patients . So it is probable that the primary site of infection of M. fermentans may be the respiratory tract, which serves as a niche for dissemination or translocation of the mycoplasmas to the joints via blood stream and induce arthritis. What are the bacterial determinants responsible for inducing arthritis remains to be elucidated. We found here that a clinical M. fermentans isolate obtained from the respiratory tract of a patient with asthma  was able to induce arthritis in a rabbit model and when injected in the trachea the microorganism reached the joints and induced arthritis. We believe our observations will shed light on new avenues to study the bacterial molecules responsible of the arthritogenic potential of M. fermentans. This study shows that a strain of M. fermentans isolated from the human respiratory tract has the ability to induce arthritis in an animal model. Based on the reported data available and the present observations it is tempting to speculate that primary respiratory tract infections may lead to the migration of mycoplasmas to joints and to the development of arthritis. Rivera A. performed the experiments to compare the arthritogenic ability of the strains, the histopathological and microbiological studies. Yáñez A. did the PCR experiments to detect mycoplasmas in joints and tissues, coordinated the study and wrote the paper. Gil C. tested the arthritogenic ability of M. fermentans, isolated the P-140 strains from the respiratory tract of an asthmatic patient. León-Tello G. and Barba E. performed the experiment to induce arthritis after tracheal injection of M. fermentans. Giono S. participated in the design of the study. Cedillo L. conceived of the study, designed the animal model, performed the statistical analysis, coordinated the study and wrote the paper. We thank Dr. Laura Riboni and Dr Yolanda Cuellar for their help in the histological study, Dr. Gail H. Cassell for providing M. fermentans PG-18 strain and her support to this study and Dr. Jorge A. Girón for review and comments.